The suprahyoid muscles are a group of four muscles, located superiorly to the hyoid bone of the neck. They all act to elevate the hyoid bone – an action involved in swallowing. The arterial supply to these muscles is via branches of the facial artery, occipital artery and lingual artery. In this article, we shall look at the anatomy of the suprahyoid muscles – their attachments, actions and innervation. 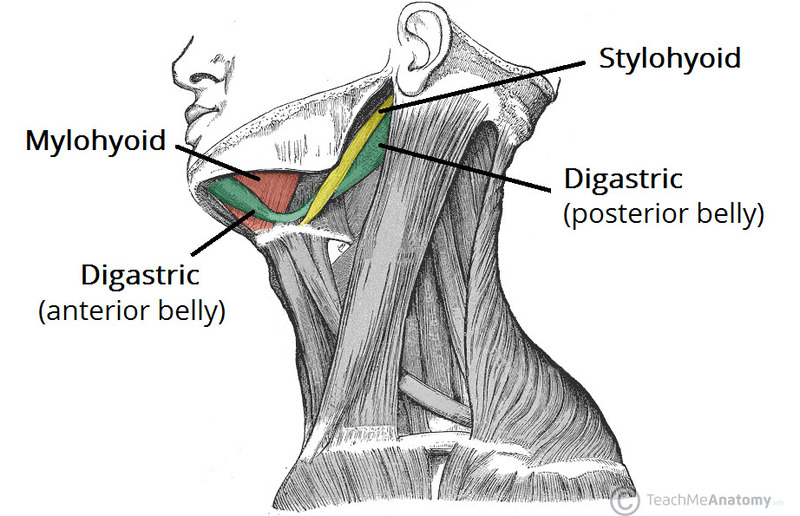 The stylohyoid muscle is a thin muscular strip, which is located superiorly to the posterior belly of the digastric muscle. Attachments: Arises from the styloid process of the temporal bone and attaches to the lateral aspect of the hyoid bone. Actions: Initiates a swallowing action by pulling the hyoid bone in a posterior and superior direction. Innervation: Stylohyoid branch of the facial nerve (CN VII). This arises proximally to the parotid gland. Fig 1 – Anterior view of the neck with the suprahyoid muscles highlighted. The digastric is comprised of two muscular bellies, which are connected by a tendon. In some cadaveric specimens, this tendon can be seen to pierce the stylohyoid muscle. The anterior belly arises from the digastric fossa of the mandible. The posterior belly arises from the mastoid process of the temporal bone. The two bellies are connected by an intermediate tendon, which is attached to the hyoid bone via a fibrous sling. Actions: Depresses the mandible and elevates the hyoid bone. The anterior belly is innervated by the inferior alveolar nerve, a branch of the mandibular nerve (which is derived from the trigeminal nerve, CN V). The posterior belly is innervated by the digastric branch of the facial nerve. 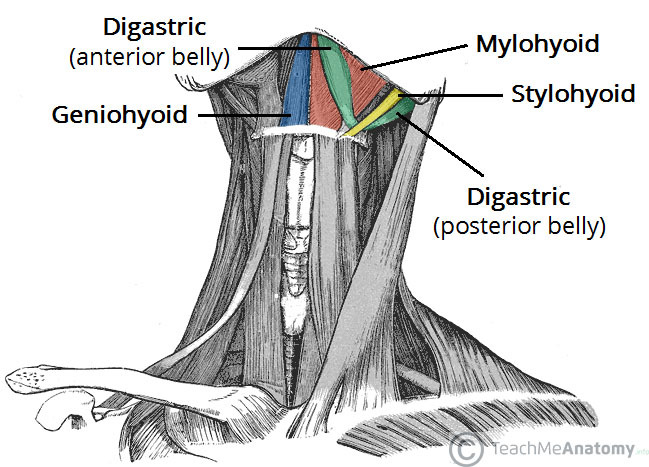 The mylohyoid is a broad, triangular shaped muscle. It forms the floor of the oral cavity and supports the floor of the mouth. Attachments: Originates from the mylohyoid line of the mandible, and attaches onto the hyoid bone. Actions: Elevates the hyoid bone and the floor of the mouth. Innervation: Inferior alveolar nerve, a branch of the mandibular nerve (which is derived from the trigeminal nerve). The geniohyoid is located close to the midline of the neck, deep to the mylohyoid muscle. Attachments: Arises from the inferior mental spine of the mandible. It then travels inferiorly and posteriorly to attach to the hyoid bone. Innervation: C1 nerve roots that run within the hypoglossal nerve. What is the main action of the suprahyoid muscles? Which of the suprahyoid muscles is comprised of two muscular bellies, connected by a tendon? Which cranial nerve innervates the mylohyoid muscle?